Weather Quote isn't just another weather app. It delivers the current weather status along with an awesome quote right on your lock screen! 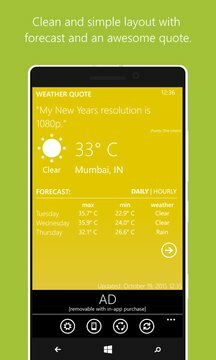 With transparent live tile and live lockscreen background, get the latest weather and quote right on your start/lock screen. The weather information is shown in clean and simple layout with the background representing mood of current weather. The app follows Microsoft's modern design guidelines combined with support for phone theme. - Set this app as your lockscreen background provider via app setup or phone settings page. - Tap & hold app from application list and select 'Pin to start' for live tile. - Both wallpaper and live tile are updated every 30 minutes, approximately. - Custom backgrounds cannot be set for WP8 512MB devices. The app is ad-supported. You can remove ads with in-app purchase. Please rate and review the app & feel free to contact via 'feedback' anytime.